MAERSK 4 / OCTOBER 2014 POST eme: e new member of the Group targets growth / 14-25 Steps to be good 28 34 When zero means zero 36 Keeping employees safe 6 "The Values are the load-bearing pillars of the Maersk Group," Chairman of the Foundation, Ane Mærsk Mc-Kinney Uggla says in an exclusive interview. 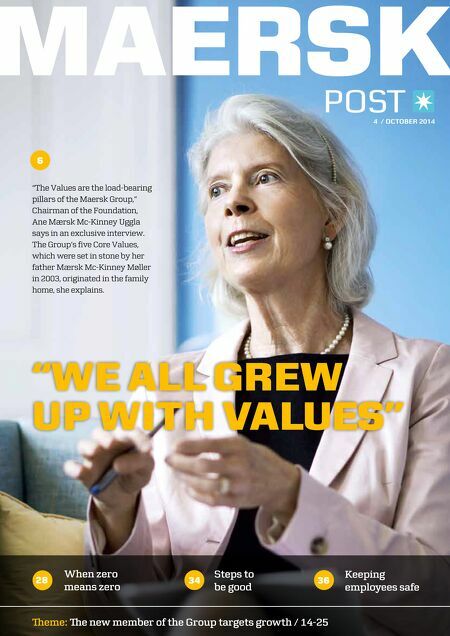 The Group's five Core Values, which were set in stone by her father Mærsk Mc-Kinney Møller in 2003, originated in the family home, she explains. "WE ALL GREW UP WITH VALUES"